Restoration Road • Run Hard. Rest Well. Roads take us from one place to another. In the Bible, I think about the trek across the Red Sea on dry ground. The road to Emmaus that first day of Easter. No matter our road, God’s intent for us is to be whole, hope-infused, and fully restored. 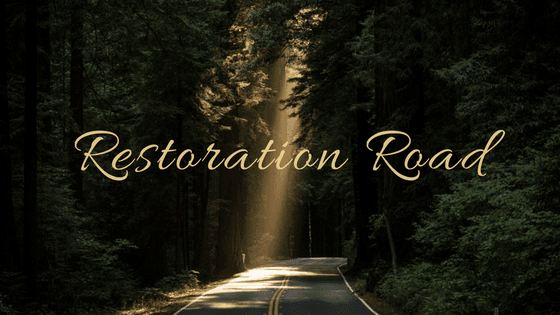 I had an opportunity to sit down with my new friend, Mitch Kruse, to talk about my Restoration Road. I will never grow weary of recounting God’s faithful, tender, love – a love that has transformed me and transforms me – everyday. If you visit the link, check out Mitch’s ministry. He is a faithful, powerful teacher and has much to offer. Onward. Eyes on Jesus! When I think of my “road”, I’m reminded of the 23rd Psalm. Initially David is speaking like he is talking to others about the Good Shepherd (He leads, He makes, He restores and such), but as David enters the valley of the shadow, his words change to “You”. I, David, will (choice/decision) fear no evil for You, Jesus, are with me. This is the only way I can walk the road before me. Jesus has a rod to kill the enemy who tries to harm me. He has a staff to pull me closer in times when I move away from Him or get too close to the edge. We’ve talked about the banquet table where we sit and talk with Jesus, where I’m invited, where no enemy is allowed, where there is plenty (food, rest, peace, healing, restoration, Truth, love). And I am reminded that, on this path, this road, I will come to, and be allowed to dwell in HIS house forever. Yes, my road has been hard. Yes, I have struggled and come up against an enemy bent on stealing my peace, my joy, my life, killing my hope, and destroying my faith, but Jesus has always been there to pull me from the edge and back to His side. I praise, worship, and glorify His Name. I had not heard all of your story, Brenda. What a privilege it was to watch it. Thank you for sharing it. I thank my God for you and that we have become friends.The peace of Christ be with you.